FILE - China's President Xi Jinping inspects People's Liberation Army soldiers at a barracks in Hong Kong, June 30, 2017. The White House says China's proposal to abolish presidential term limits — a move that could make Xi Jinping president for life — is an internal matter for Beijing. "I believe that's a decision for China to make about what's best for their country," press secretary Sarah Huckabee Sanders said at a Monday press briefing. Term limits, Sanders said, are something Trump "supports here in the United States, but that's a decision that would be up to China." The Chinese Communist Party proposed removing the presidential two-term limit from China's constitution, state media reported Sunday. The move would be a further consolidation of power for Xi, who is already seen as one of China's most powerful leaders in decades. FILE - U.S. President Donald Trump waves next to Chinese President Xi Jinping after attending a joint press conference at the Great Hall of the People in Beijing, Nov. 9, 2017. On Monday, U.S. President Donald Trump praised Xi, saying he has a "very good relationship" and "great respect" for the Chinese leader. "I think that President Xi is unique. He's helping us with North Korea," Trump said during a White House meeting with U.S. governors. Trump has not specifically addressed the issue of China removing term limits. To some, Sanders' comments are the latest evidence of a break in the long-standing U.S. tradition of encouraging democracy in China, and reflect an unwillingness to criticize undemocratic regimes. "In effect, she is saying that the U.S. is OK with Xi Jinping simply asserting that he will remain in power indefinitely," said Sophie Richardson, China director at Human Rights Watch. "Does she realize China isn't a democracy?" During the presidential campaign, Trump regularly slammed China and its trade policies. But since becoming president, Trump has toned down the criticism. Instead, Trump has prioritized working with China to address North Korea's nuclear and ballistic missile programs. 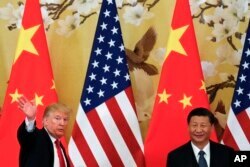 However, several reports suggest the White House could soon announce trade decisions, such as tariffs on Chinese imports, that could strain the U.S.-China relationship.